Today's the last day of February and the last day for our kitchen ceiling work. The first coat of paint went on yesterday and it looks great. The final coat goes on this morning. We're keeping our fingers crossed that the heavy rain squalls we're having will not cause any leaking. 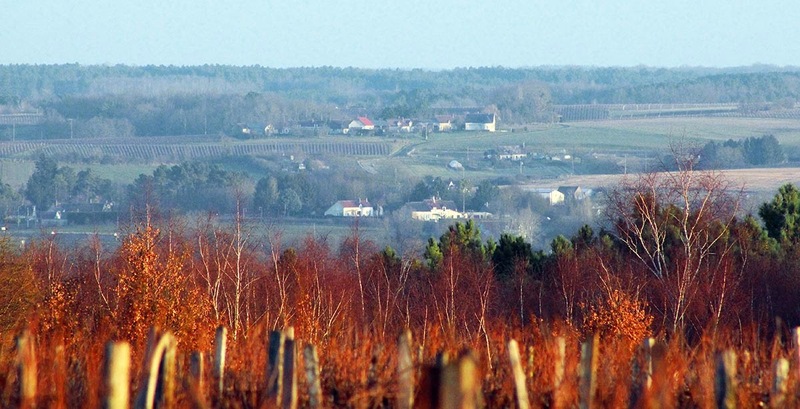 A gratuitous shot of our hamlet seen from the vineyards on a relatively sunny day. Not today. The kitchen won't be any different except for the ceiling. That and the good cleaning everything's getting as it all gets put back together. Next up: the den in May. Once we can turn off the central heating and drain the system, we can take down the radiator in the den. Then the contractor will remove the remaining wallpaper and repair the ceiling. It's the only ceiling we haven't painted since we moved in nearly eleven years ago. Then I will paint the walls when he's done. With about three weeks to go until the equinox, I can really tell that the days are getting longer. It's nice for our morning walks because we don't have to wait for light. And we also don't have to rush out in the evening before it gets dark. 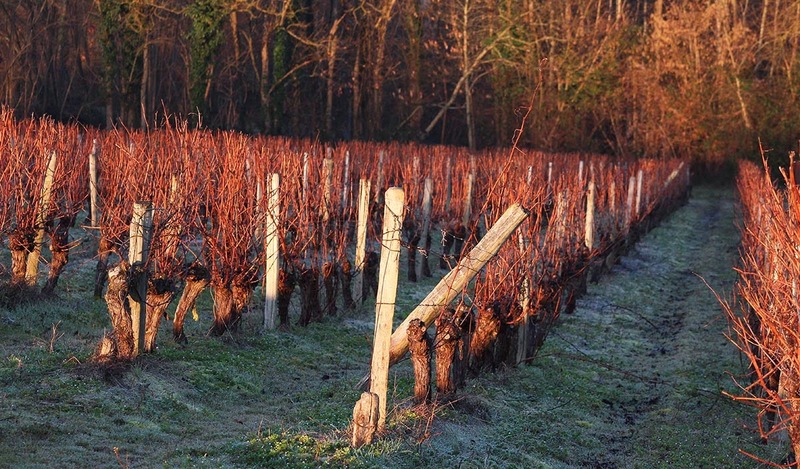 Grape vines, still waiting to be pruned, in the morning sunlight. The contractor got the paper up on the kitchen ceiling on Wednesday and it looks really good. Smooth and white. Today he'll put the first coat of paint on, then a second coat on Friday morning and it will be all done. This weekend we'll be doing a spring cleaning of the walls, floors, and windows before moving all the stuff back in. You all know that I use the Photoshop software package to do what they call "post-processing" of my photos. All that means is that I use the computer to crop and straighten and sometimes mess with the lighting and color aspects of my pictures. This time, I tried something new. 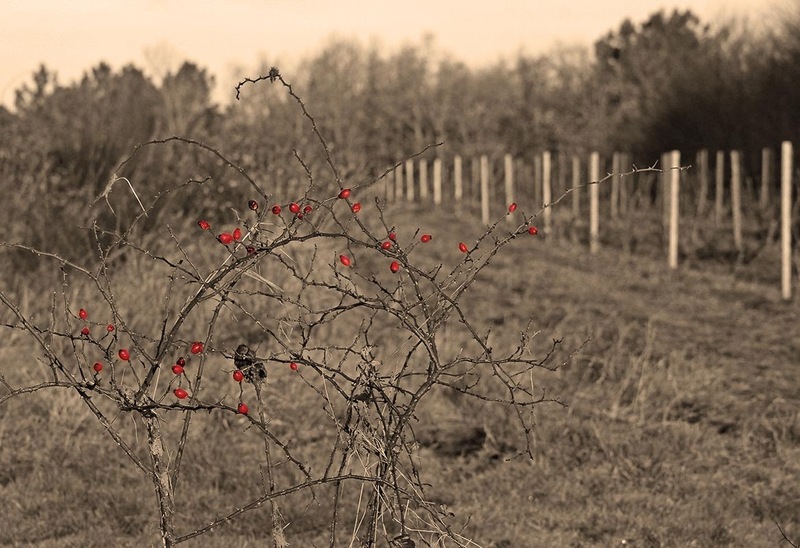 I removed all the color except the red of the rose hips. I found out how to do it from a tutorial on the internet. I'm not sure it's the best picture for it, but the technique seemed to work. During my walk Monday morning, I saw a small flock of what I at first thought were geese flying northward. Later I wondered if they might not be grues cendrées (common cranes). They must be returning from their wintering grounds in southern Spain. 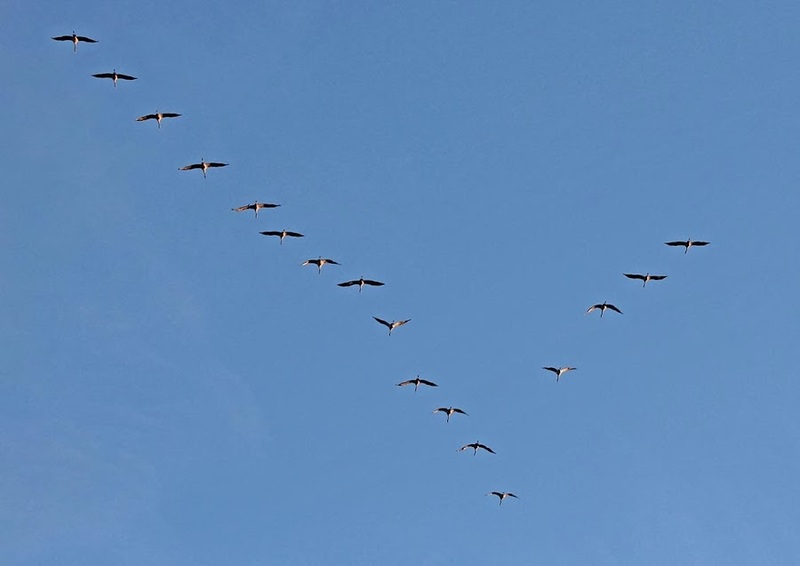 There were seventeen big birds winging silently above me, not a honk to be heard. Luckily, I had the telephoto lens on the camera. They certainly look like geese to my untrained eye, but I think they're probably cranes. Later in the afternoon I saw another small group going in the same direction. I don't know if it's early for returning migrators or not. It sure has been warm. I didn't even build a fire in the wood burner yesterday. The classic "V" formation, or maybe in this case, the "check mark" formation. That's what this "elbow" would need to get it working again. It's another in the series of machinery shots from the artsy organized neighbor's collection. Today we're working on cleaning out the kitchen in advance of the ceiling work which starts on Tuesday. All surfaces have to be cleaned off, pictures have to come off the walls, and the work table has to come out. We don't have to empty the cabinets. I also have to take down the ceiling light fixture early Tuesday morning (the contractor would do it, but it's kind of delicate so I'm going to do it myself). We'll be setting up the coffee maker, toaster oven, and microwave in the dining room. The contractor will be scraping the water-damaged paint peels, then smoothing the ceiling with a light layer of plaster before applying a wall-paper like product to strengthen the surface (and also hide any minor cracks that may form in the future) before finishing with a couple of coats of new paint. The work is supposed to last four mornings, so it should be done by Friday. 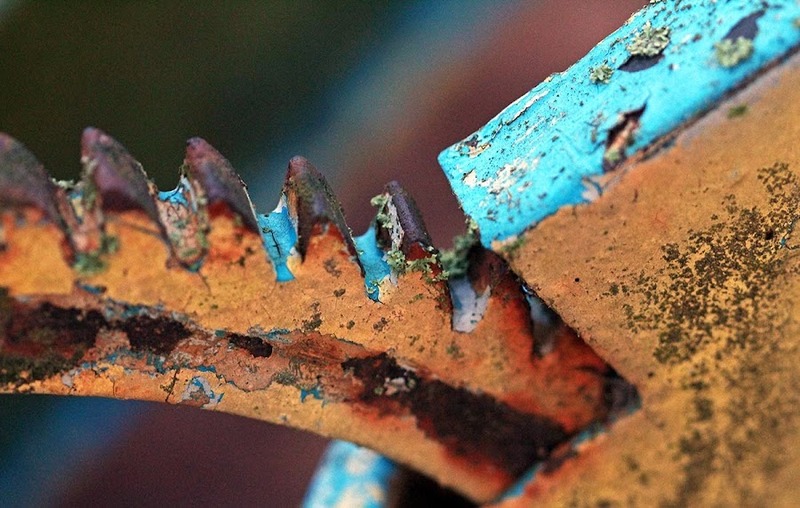 This is part of an old rusty plow that the artsy organized neighbor has stored among his collection out beside the vineyard. 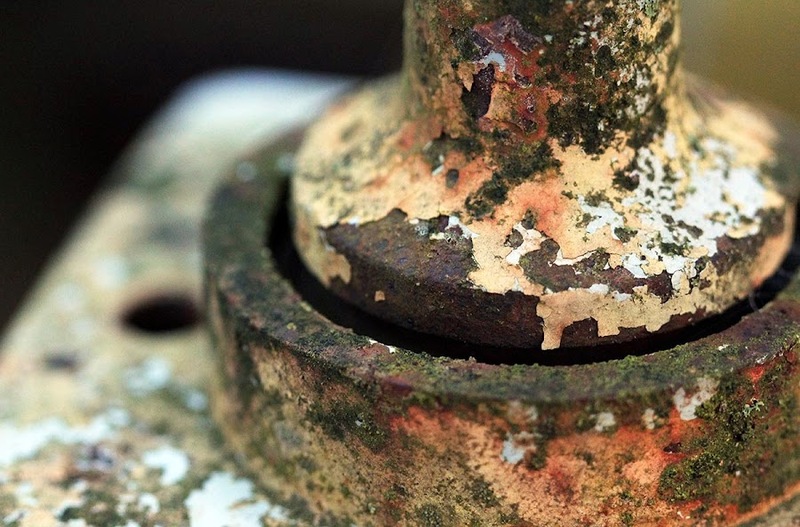 I liked how the rain collected in the curve of rusted metal just below the nut and bolt. Rusty metal and a dead oak leaf. I made a decision about the sports channels I wanted and added them to my subscription on Saturday. I appreciate the comments about watching tennis on the computer, but the satellite is more convenient. With the satellite boxes (we have two, one in the LR and another up in the loft) I can record matches that are broadcast live over night, which happens when tournaments are being played on the other side of the world. Also, I learned that this new sports channel is carrying Wimbledon through 2018 and NFL (American football) games for the next two years. The ability to watch on either television, record for later viewing, and get the NFL made the extra cost seem worth it to me. I've got them right where they want me. Again from the artsy organized neighbor's collection, a bit of old rusty machinery. I know I've shown some of this before, but I see something different each time I go by, so you see what I see. 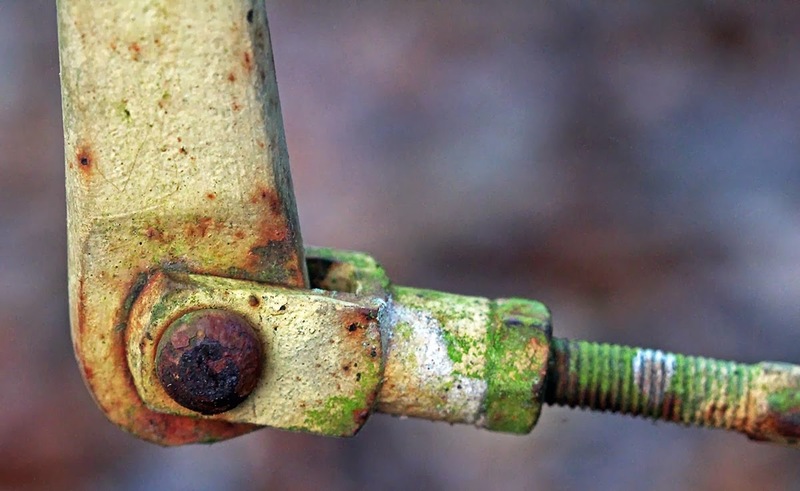 The paint, the rust, and the lichens combine to make a colorful image. I'm dealing with a stupid problem right now. I like to watch tennis on television and over the past few years, different channels have been competing for the rights to certain tournaments. I thought I had it settled a year ago when I subscribed to a rather pricey package to get the tennis tournaments they had pilfered from the sports channels I already paid for. Now, this year, a new station (that's not part of the satellite package I'm paying for) has bought up the rights to a lot of those same major tournaments I enjoy. So I have to decide now if I want to pay even more to have that new channel added to my satellite subscription. They've got us coming and going. 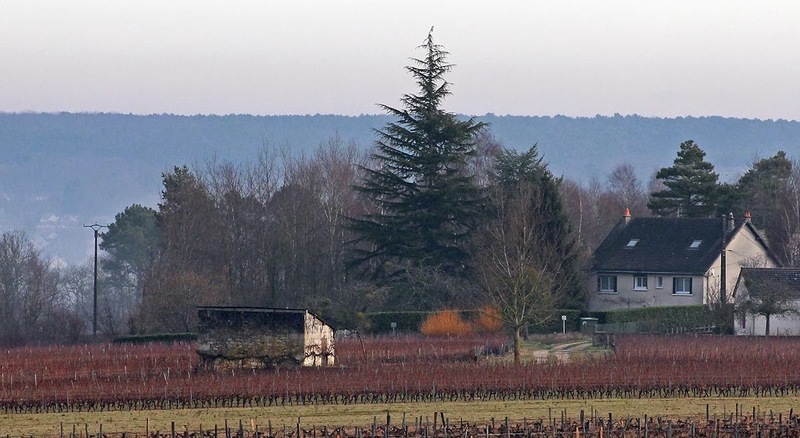 These saules (willows) grow all around the edges of the vineyards. Right now they are flowering, their fuzzy buds popping out in our late winter's warmth. I also noticed that our forsythia is starting to flower. 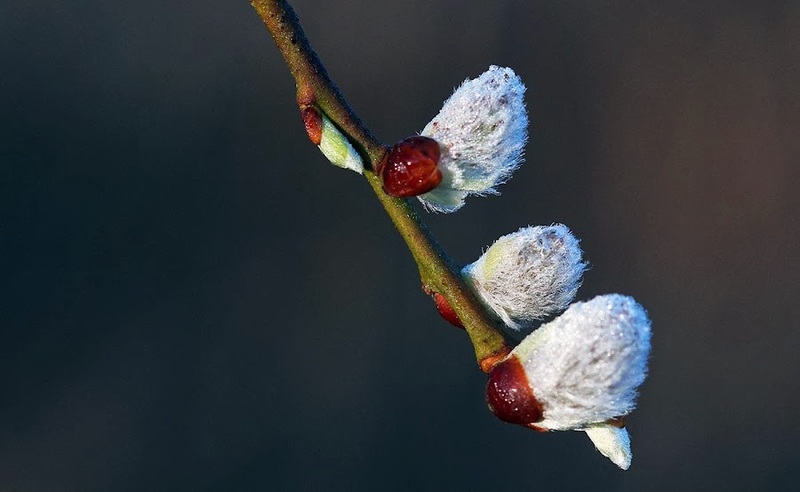 The willow's flowers are called chatons in French (catkins, from the Dutch kattenken, meaning kittens). Both of these plants flower in early spring, so it's not surprising to see them now. I'm hoping we don't have a spring freeze this year. 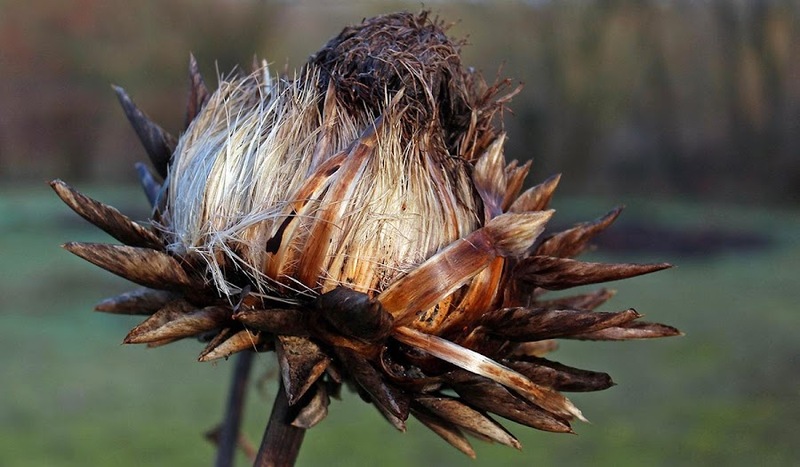 That could kill the early buds and blossoms and affect the fruit and nut crops. 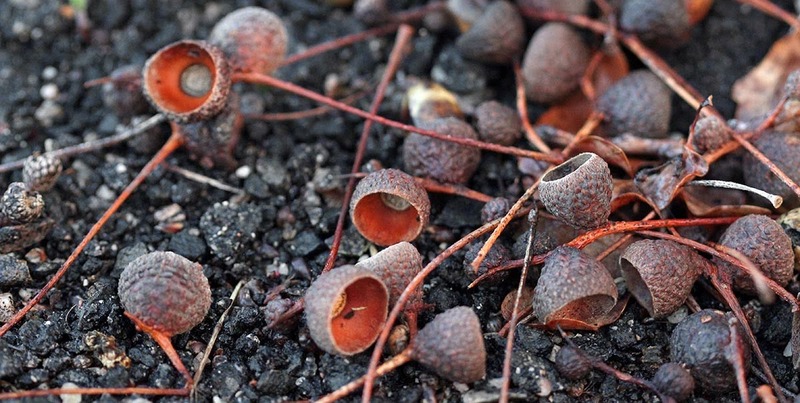 Or, what's left after the critters take the fruit. There are still plenty of whole acorns scattered under the oaks that grow around the vineyards. I don't know if that means that the oaks produced a lot last year, or that the critters are finding other sources of food during this mild winter. After a few relatively dry days (thank goodness), the rain is back. It's not raining much; we had a few squalls on Wednesday and just some light drizzle this morning. I noticed them on Sunday. There is a single yellow crocus poking up in the bare dirt where I saw and split firewood. I'm trying not to trample it. 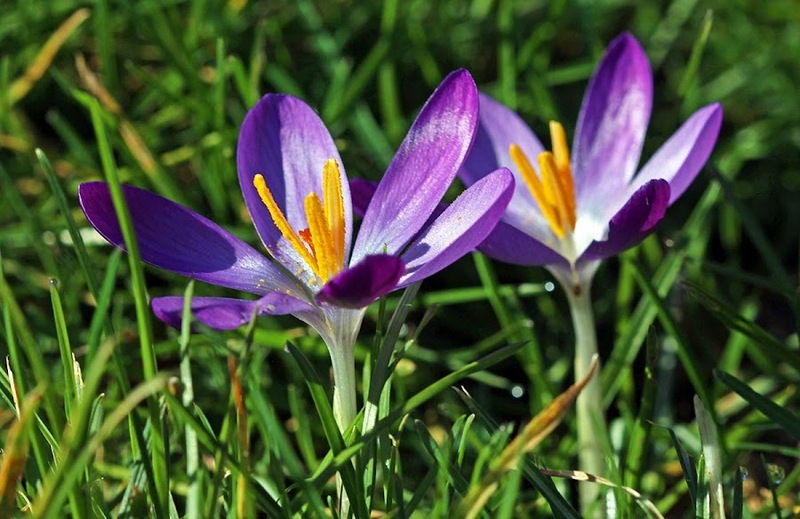 Out back, in the grass among the cyclamen, I counted at least eight purple crocuses blooming in the sunshine. Two purple crocuses adding a little color to the lawn out by the well. In other parts of the lawn, the primroses are blooming. I also see the daffodils, tulips, and hyacinths are up. We're still a few weeks from flowers on those.. 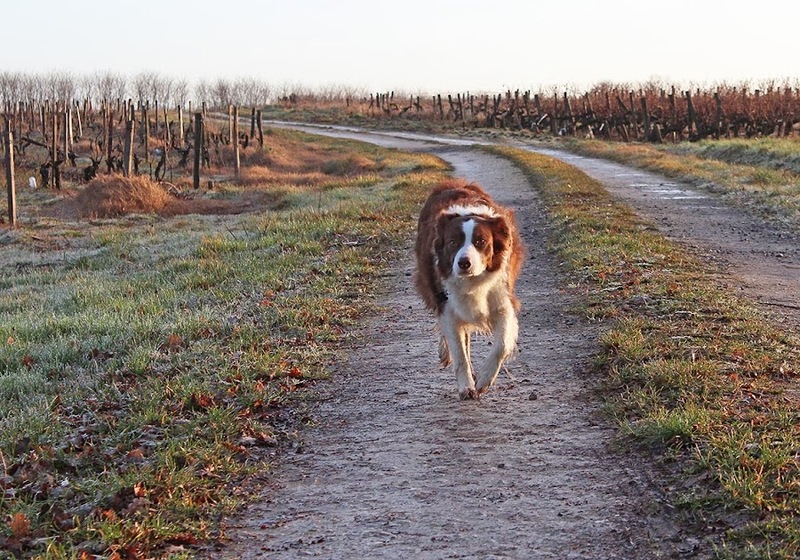 The other day, Callie and I walked through the artsy organized neighbor's land next to the vineyard. 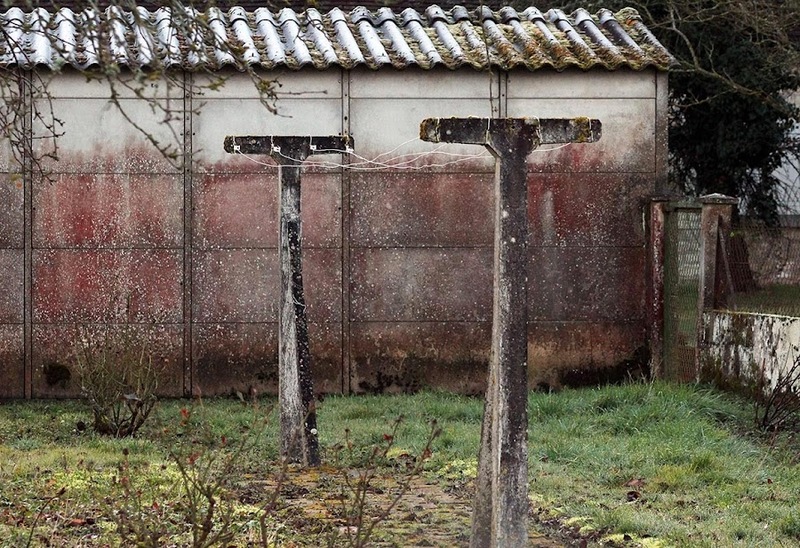 It's just a plot of land where he stores wood, old machinery, bits of metal, terracotta tiles, and old road signs. There's no house; I think he might live down in the bottom of the adjacent ravine, but I'm not at all sure. There are just piles of stuff here and there, including dirt and gravel. 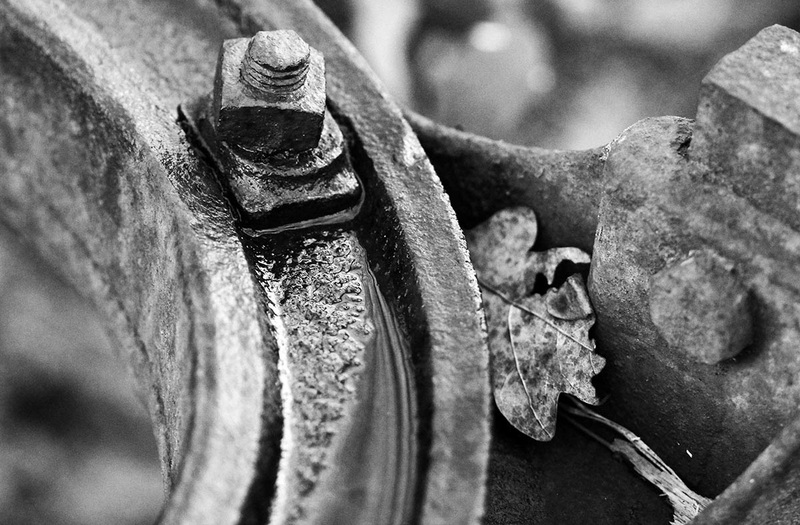 Part of an old rusty piece of machinery parked under the trees next to the vineyard. Today we're expecting a repair man to come by and look at our kitchen stove. The electric burner seems to be shorting out as it trips the main house breaker every time we turn it on (the stove has three gas burners and one electric burner). Using the oven has no effect on the breakers so we think it's just the burner. The repair man is from the company that made the stove and we're hopeful he'll know what to do to fix it. We're planning to take this opportunity to move and clean behind and under the stove. I shudder to think what it looks like back there. After a mostly sunny Sunday (appropriately named), we experienced a short rain squall. It lasted maybe ten minutes. 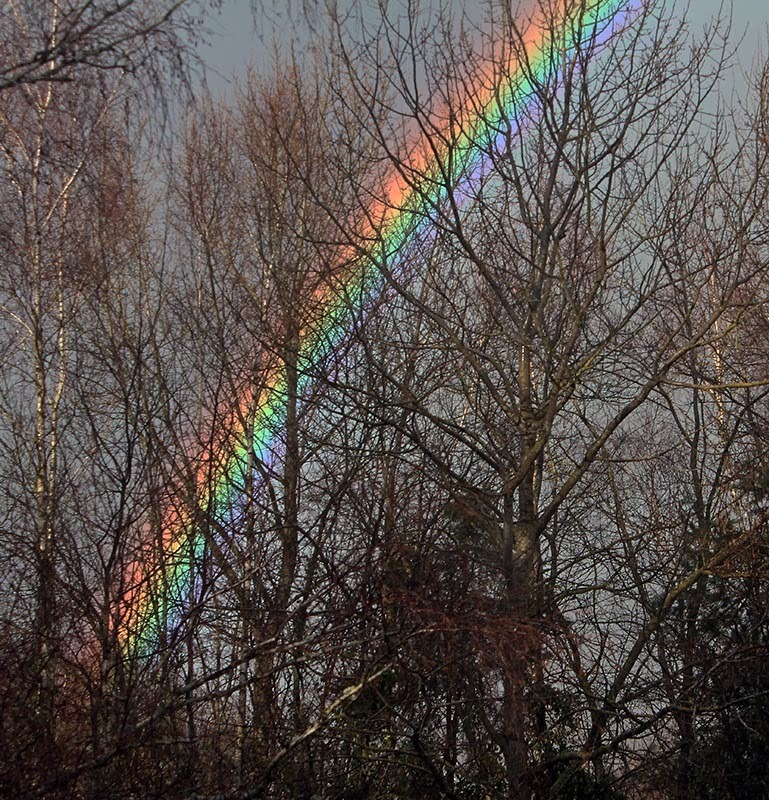 The sky cleared as it passed toward the northeast and treated us to a brilliant arc-en-ciel (rainbow). Looking toward the northeast. The sun was already shining on us as the rain squall moved eastward. These photos don't do it justice. 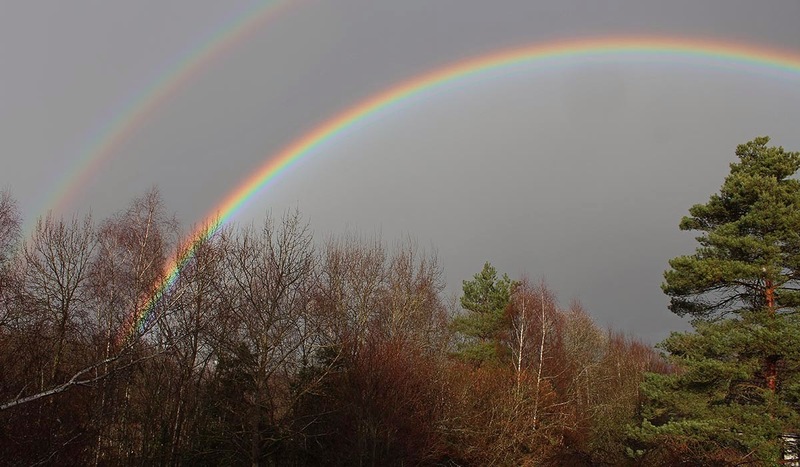 The rainbow stretched in a perfect unbroken arc from north to south, bright and clear from one end to the other. I couldn't get the whole thing in the frame from our deck, so these partial shots will have to do. 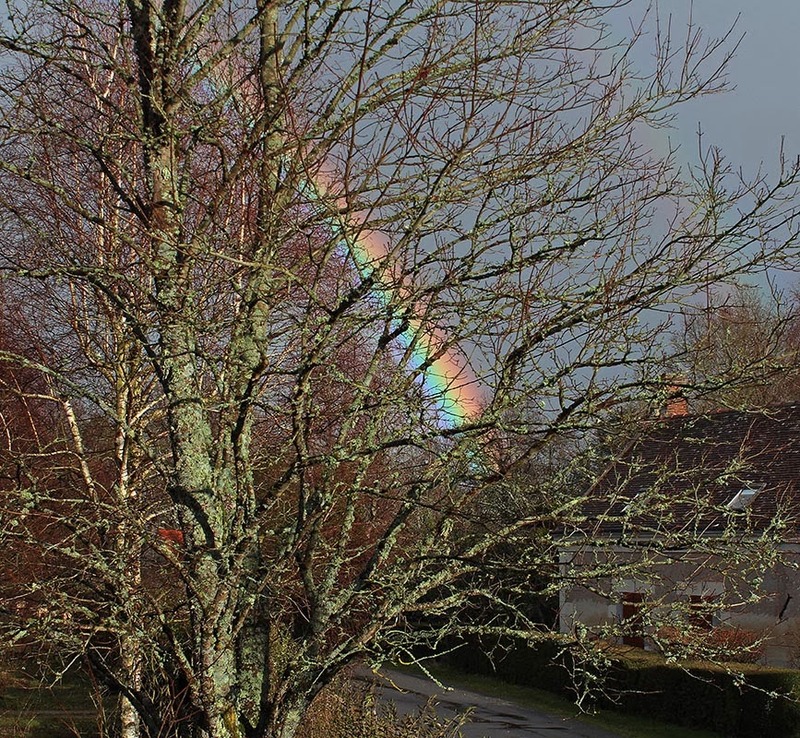 As the squall passed on out of sight, the rainbow started to fade. First from the top of the arc, then progressively down each side until I could only see the stubs of the rainbow through the trees at ground level. Then they, too, faded. Looking out the kitchen window toward the rainbow's southeast leg. 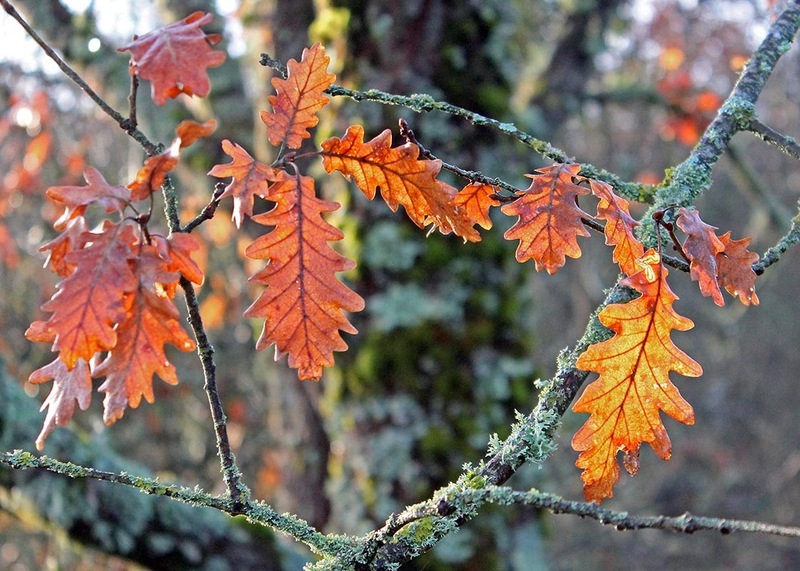 These oak leaves will hang on through winter until new spring growth pushes them off. They provide a little color when the sun shines through them. Otherwise, they're just brown. 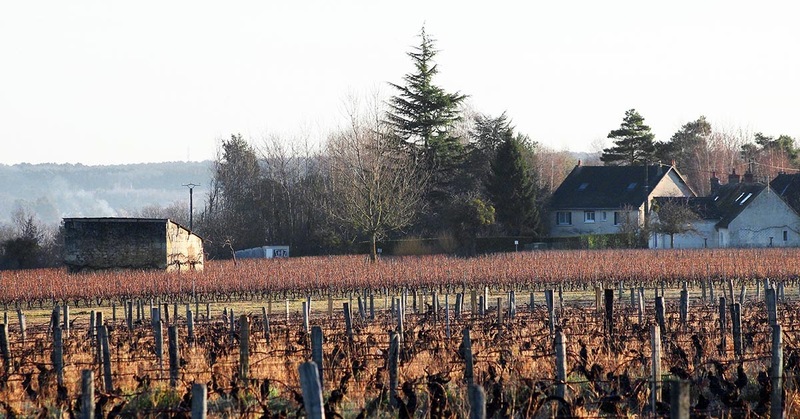 Everyone I've encountered on my walks through the vineyard is singing the same tune: enough! People are sick and tired of this constant wet weather. Y'en a marre! On a ras le bol! Ça suffit! Don't get me wrong, we really can't complain much given how bad things are on the Channel coasts, and in Brittany and southern England. But sloshing around in puddles and mud gets tedious. Especially if your job is to work outside all day pruning grape vines or doing construction/maintenance work. Some snow and freezing temperatures would be a welcome change. Then, at least, we could complain about something new. I still haven't cut down the dead artichoke stalks in the back yard. Now the leaves have begun to peel back and fall off to reveal the fluffy choke inside each flower head. Meanwhile, at ground level, new leaves are sprouting. One of last year's artichokes. They'll get cut back when we have some dry weather. I also noticed that the rhubarb plants are breaking through the soil. I think they're about a month early. In 2012, I took pictures of them pushing up in the middle of March, which feels normal to me. Last night was quite warm for mid-February and our low this morning is above 9ºC which is close to 50ºF. Boy did we have some rain on Thursday morning. When Ken took Callie out, and she didn't really want to go, there were thirty millimeters of rain in the gauge, and it was pouring buckets. We got more before the morning was over. 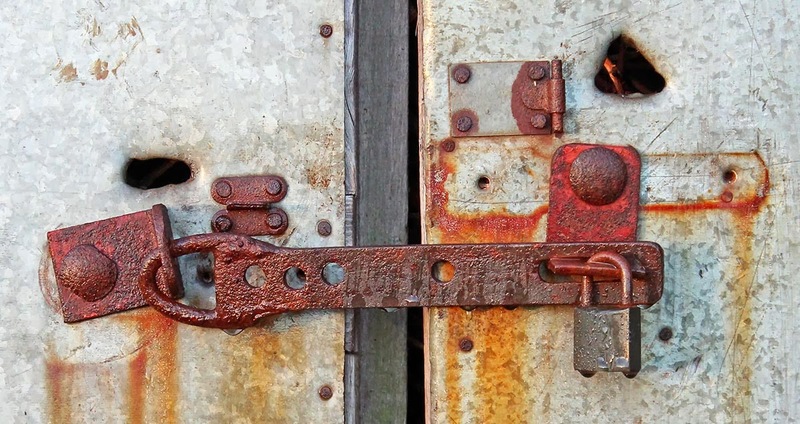 The lock on the storage shed out in the vineyard behind our house. Once the rain stopped, the wind kicked up again. It's the pattern this winter. Warm storms off the Atlantic with high winds, lots of rain, and very little space in between. We haven't seen any snow this year, and it doesn't seem likely at this point. Here's Callie running toward me on Wednesday morning. We were out near the far end of our walk where the roads intersect. When a car or two goes by, she hangs back. She doesn't like cars. That look in her eyes is typical, pure Callie. You can see that Callie's paws are muddy. But they're less muddy than usual because this morning was cold and a little frosty. After the cars pass, she runs out to where I'm standing, waiting for her. I get a quick kiss and we turn back toward home. Tuesday morning saw a flurry of activity, at least for us. Ken had an early doctor's appointment and I had a couple of errands to run in town. All went well, with one hitch. I was turning in some paperwork at the health service office. I thought I had everything I needed, but I had completely forgotten to bring my official identification. So I had to get back in the car and head home (all of two or three miles) to fetch it. A communications tower to our southwest. When I got back to the health service office I didn't have to wait in line and everything was cool. I also had to stop at the lawyer's office to turn in some more papers (our wills) and then stop at the supermarket. When I got home, Ken told me that the boiler that runs our central heating system had shut itself down. He had called for a repair, but the technician wouldn't get here until the afternoon. Since the house was cold, I built a fire in the stove while Ken made lunch. The technician arrived soon after lunch and replaced a small part to get the boiler working again. Thank goodness, because it's cold this morning! Here's another shot from our side of the river over the valley to the other side. 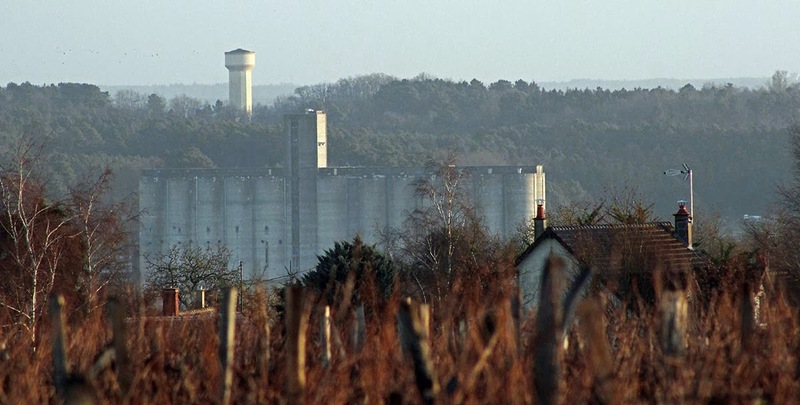 You can see a few houses on our side of the river in the foreground, the grain silo which sits along the railroad tracks on the other side, and a water tower on the heights to the north. Looking north at sunrise. On a day with sun. I got out a map and measured the distance from where I stood to various points in the picture. From there to the water tower is a little over 4 kilometers, or about 2.5 miles. To the grain silo it's 2.9 kilometers, just over a mile and a half. This is a patch of tall grass in an abandoned vineyard plot. The grass is from last year, of course, and now it's dry and brown. Well, the plants are dry, but the ground is a saturated mess of mud. In a couple of months the old stalks will be taken over by new growth. One amber wave of grain. Well, not quite amber. We still have a few months before we can hang clothes outside to dry. This clothesline belongs to one of our neighbors. She uses it when she's here in the warmer months. We use ours, too. It's nice to be able to hang clothes outside in the nice weather. A common sight around here: concrete clothesline poles. We also have a clothesline hanging in the utility room, along with a drying rack that stands on the floor. In winter, the clothes hang inside. Ken drapes some items on the radiators, too. They dry faster and humidify the rooms at the same time. Our ten year old clothes dryer is in very good shape seeing as it doesn't get used much. But every now and then you just need to dry something in the machine. The series of Atlantic storms just keeps on giving. Southwestern England and Wales are getting it big right now, and Brittany is still reeling from, and continues bracing for, high wind and storm surges. We are being spared the brunt of these storms as they normally move through to our north along the English Channel. 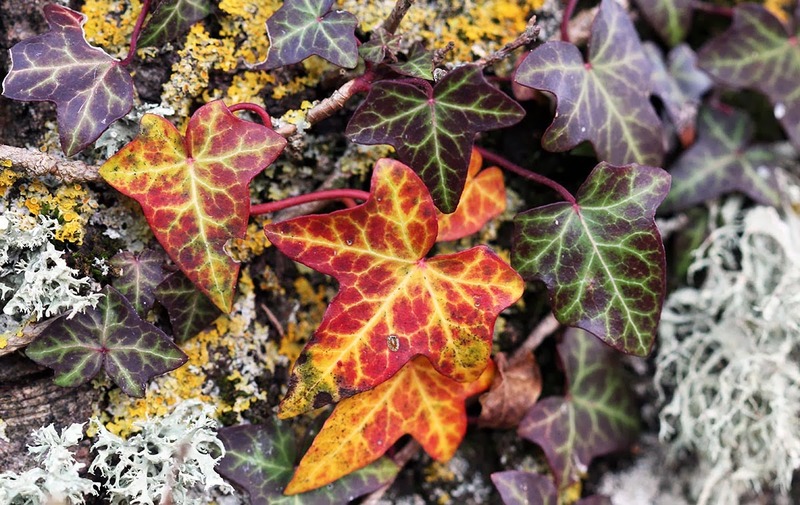 Ivy and lichens cling tightly to the trunk of a tree. Even the high winds can't peel them away. Still, the edges of these systems brush by us bringing rain and high winds, although not anywhere near what they experience along the coasts. This morning the wind kicked up around five o'clock and it's gusting out there now. It's much less violent than Thursday night's wind, thankfully. And it's also raining this morning. Callie and I will be heading out for our walk soon. I'll need the rain hood. Remember when I told you about propagating hydrangeas? At the end of the summer I made some cuttings from our single hydrangea with the intention of making new shrubs for the front of the house. 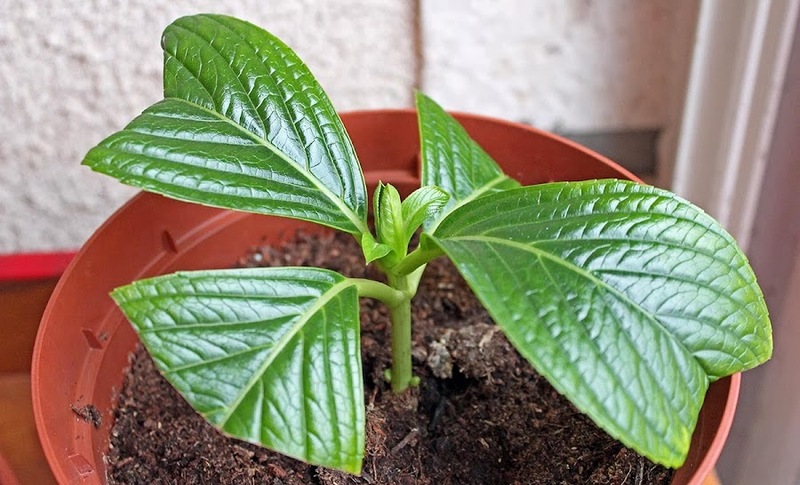 I let them root in sterile soil for a few months, then transplanted them into bigger pots so they could grow. Each cutting started out with four trimmed leaves. You can see the new growth in the middle. Well, they seem to be doing fine. They're putting up new leaves, albeit slowly. It is winter after all. I've already started to increase their water regimen. As spring gets closer, I plan to add in some plant food to spur their growth. Even more new leaves in the middle of this cutting. I made eight new plants in all. I'm hopeful that they'll be sturdy enough to plant outside by late spring/early summer. I'll keep you posted. Didn't Popeye say that? I guess he would have lost that tough-guy image if he said, "you can knock me over with a feather." Or ate spinach quiche. None of that has anything to do with this photo of a dead tree trunk knocked down by the wind. 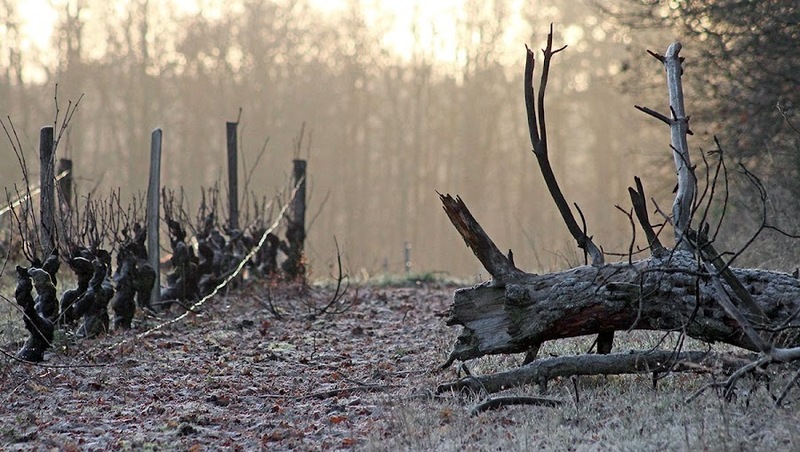 Dead wood in the vineyard. I think it's been there for a while, but I'm not sure. Trees in this patch of woods blow over all the time, and sometimes they fall across the vine rows. With this year's relatively warm winter (so far), we're seeing early signs of spring. Among them are les paquerettes (lawn daisies), a wild perennial that usually doesn't flower in winter's cold. But when the winter is mild, they will put up a few blooms. 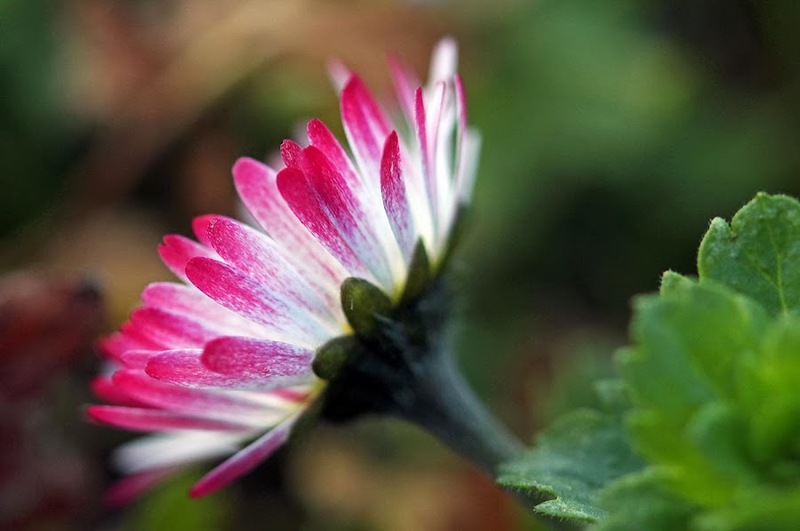 The underside of many daisy petals are tinged with red color. 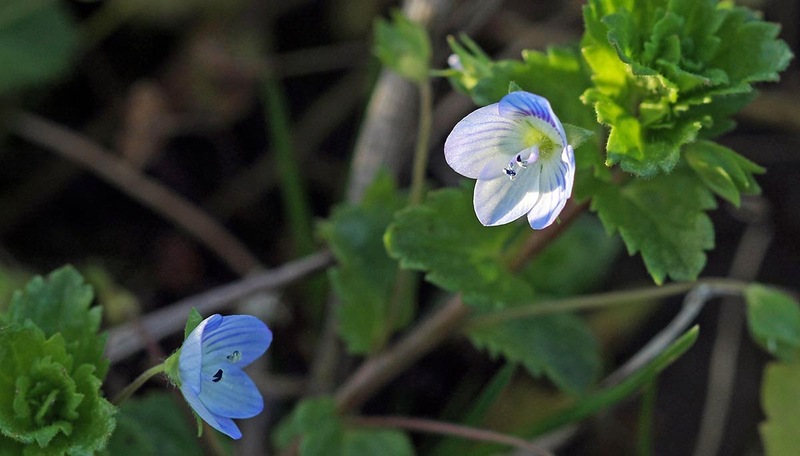 I've also seen la Véronique de Perse (persian veronica), blooming out there. That flower is also a spring bloomer, but can (and obviously does) produce flowers as early as February. As you know, I'm not an expert when it comes to identifying flora and fauna. I use the internet to help me and sometimes I get it wrong. As always, feel free to let me know if you notice that I've misidentified something. 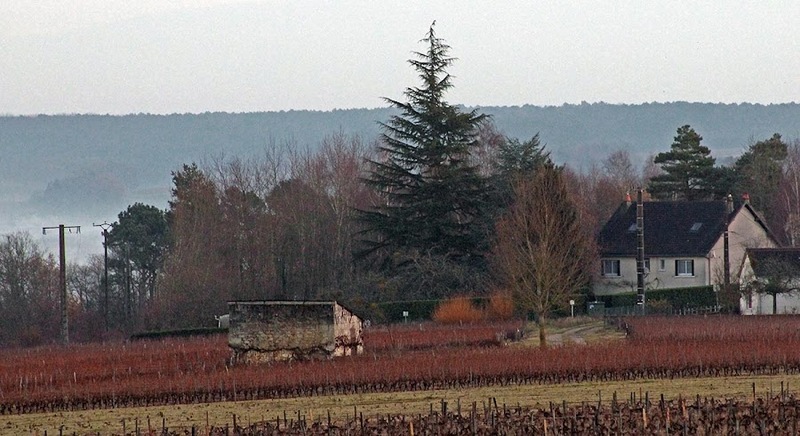 Here's a view toward the north from the vineyards out behind our house. This is a particularly high spot among the vines and you can see, when it's clear, right across the river valley to the other side. Look closely and you will see vineyards on the hillsides in the distance. Higher up on the river bank is the western end of la Forêt de Gros Bois. A relatively clear morning in the Cher Valley. Yesterday, as I was writing my blog post, I decided that I would indeed go out and grab a couple of those electric pole insulators. I got dressed (it was cold) and got some tools and went out back only to find the guys loading the cross-bar with the insulators onto their truck to haul away. So I asked them if I could have a couple. The boss guy said sure because they would otherwise end up at the dump. He used a big crescent wrench to detach two assemblies for me (like the five insulators seen in yesterday's photo). He was going to give me more, but I told him thanks, five was enough. Now I have to clean them up and see if I can get them apart. 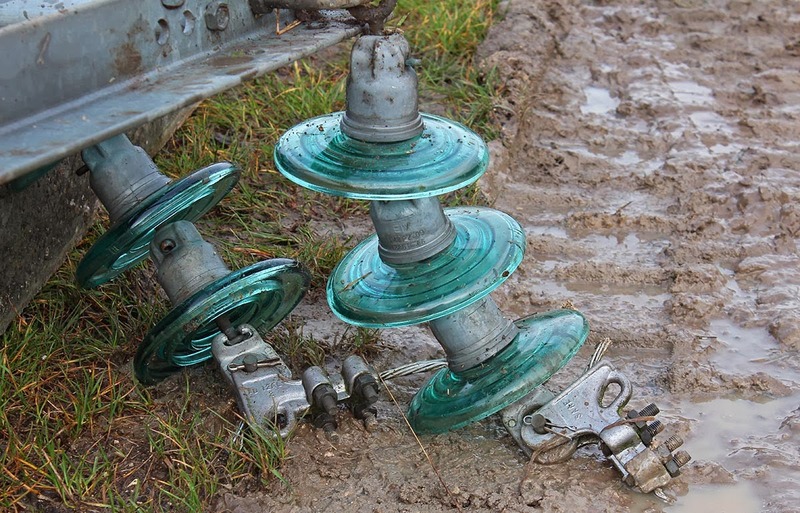 These are some of the glass cap-and-pin isolateurs (insulators) that hung from the electrical poles that served our hamlet. They're still out there on the ground and I'm still debating with myself about whether to go get one or two. I'd only need a pair of pliers to remove them from the downed pole as they seem to be held on with simple goupilles (cotter pins). Insulators attached to the pole on the ground out behind our house. It turns out that there's a group of insulator collectors based in the United States and, surprise, they have a web site. You can click here to see it if you're so inclined. My maternal grandfather used to work for a telephone company in upstate New York and he kept numerous blue glass insulators around his house. He also had an old wooden telephone wire spool or two in the back yard, up-ended and used as a picnic table. 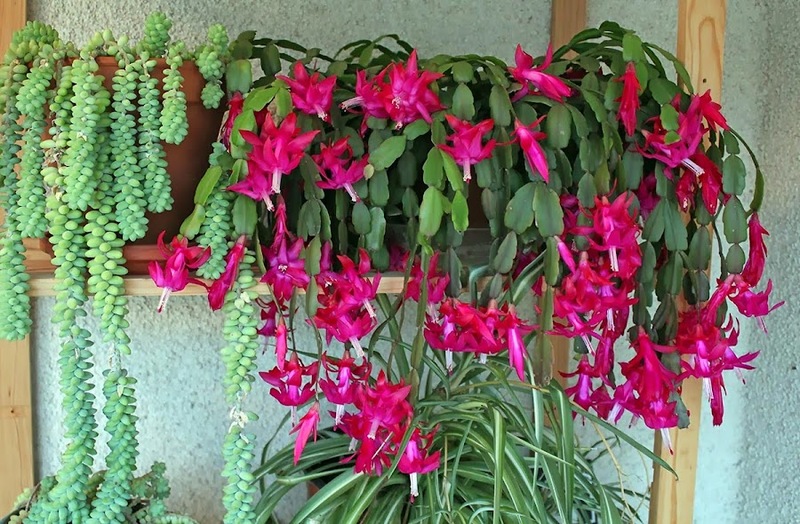 We have three or four schlumbergera (cactus de Noël or Christmas cactus) around the house. They all came from the same sad little plant we found when we moved in over ten years ago. 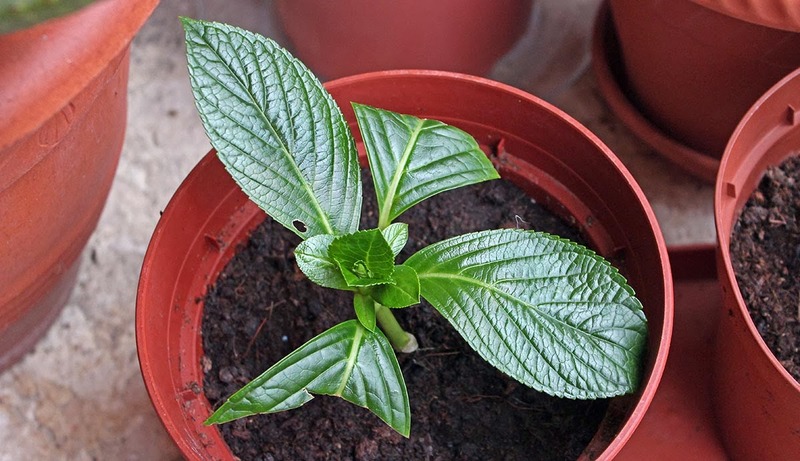 Since then, we've propagated it into different pots with amazing success. One of many schlumbergera in the house in full bloom inside our glassed-in porch. It rarely blooms at Christmas time, however. February seems to be it's favorite time to bloom. In fact, one year I started calling it a Presidents' Day cactus after it's blooming preference. This year, it's decided to bloom a little early, in late January and, now, into early February. The "after" photo, taken 31 January 2014. If you compare it to the December photo (below), you can see which poles were removed. The most obvious, to me, is the pole that was between where I was standing and our house (on the right side of the picture). The other missing pole is on the far left below, now gone in the photo above. The "before" photo, taken 20 December 2013. There are actually three poles on the left in the "before" photo. One is very hard to see; it looks like a tree trunk and is to the right of the other two. 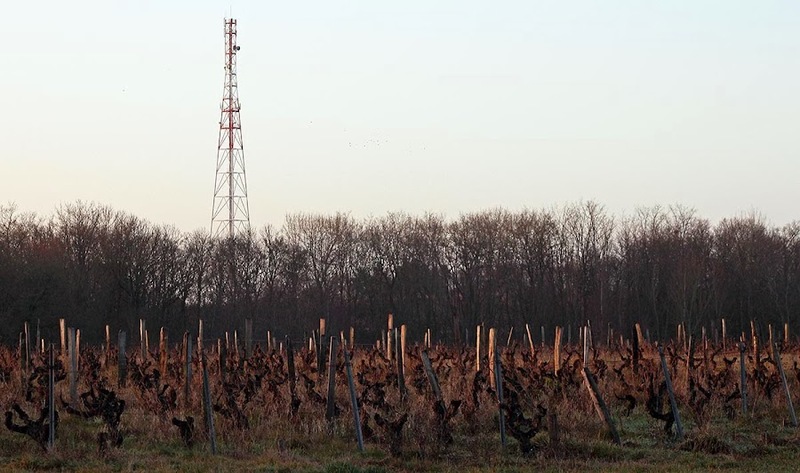 The center pole is still standing because it's planted right in the middle of a vineyard parcel. It'll be interesting to see how they take it down.